So, 1978. Let me tell you about 1978. First off, it was still the 1950s sometimes, thanks to Sha Na Na, Grease and Happy Days. On the other hand, we had three Popes that year! Jimmy Carter brokered Mideast peace and signed the Panama Canal treaty. The Cowboys won the Super Bowl, the Yankees took the World Series, and M.A.S.H. and Little House On The Prairie weren't even half over. Me, I was eight years old, and if there was one thing I loved more than pestering anyone with a car to take me to see Star Wars again, it was watching cartoons on TV. Sadly, apart from Bugs Bunny re-runs, that Fantastic Four show starring Herbie the Robot, and of course, Super Friends, our network cartoons were all dreck like Fangface, Web Woman, and Galaxy Goof-Ups. Meanwhile in Japan, lucky shoujos and shonens were literally wallowing in an ocean of colorful, wild, and occasionally ridiculous pop culture, as Japan's entertainment machine kicked into overdrive spewing out Pink Ladys and Ultramen, Chogokin super robots and Micromen and Space Invaders, all part of a nation's creative output... including an anime industry that just might have hit its peak in 1978. Seriously? 1978? Japanese animation as we know it has been a thing for more than fifty years. Why would I do something so silly as to pick a year and claim it's the greatest? Well, okay. I freely admit this is a foolish, subjective endeavor designed primarily to let me cheerlead for some of my favorites, using forty years of hindsight as leverage. 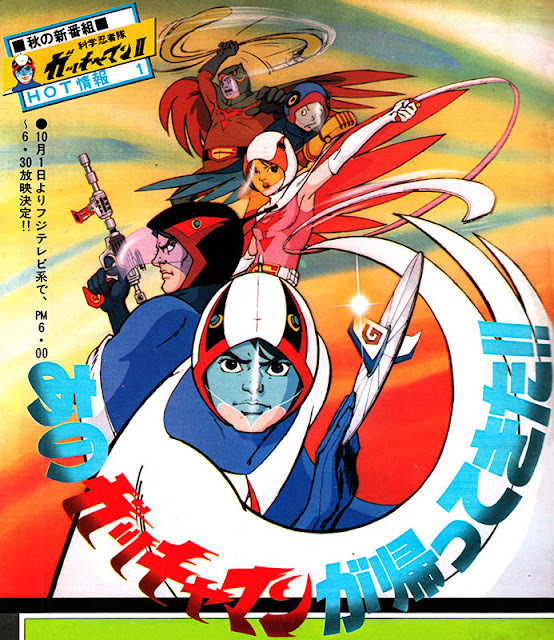 But even skeptics have to admit 1978 brought new works by some of Japanese animation's greatest talents and sequels to some of anime's greatest properties. Japan's class of '78 cartoons proved popular around the world and many of these shows are still watched today. We're still feeling their impact forty years after the fact. The year started out with an advantage thanks to all the terrific anime that carried over from '77. The Leiji Matsumoto-created super robot series Danguard Ace continued to show Ichimonji Takuma and Captain Mask battle Leader Doppler and his army of monster robots. Candace White Adley struggled from heartbreak to heartbreak in the landmark shoujo anime Candy Candy. The "Robot Romance" series of Tadao Nagahama began with Voltes V, which we'll be seeing released here on DVD soon from Discotek Media. In Japan's movie theaters, Space Battleship Yamato came cruising back with the July release of the film Farewell To Space Battleship Yamato: Soldiers Of Love, or, as the English-language text on the promotional material dubbed it, Arrivederci Yamato. After 1974's tepidly-received Yamato TV series and a vastly more successful 1977 release of a compiled Yamato movie, the question was, could producer Nishizaki turn Yamato into what today we call a "franchise?" He could, and did. 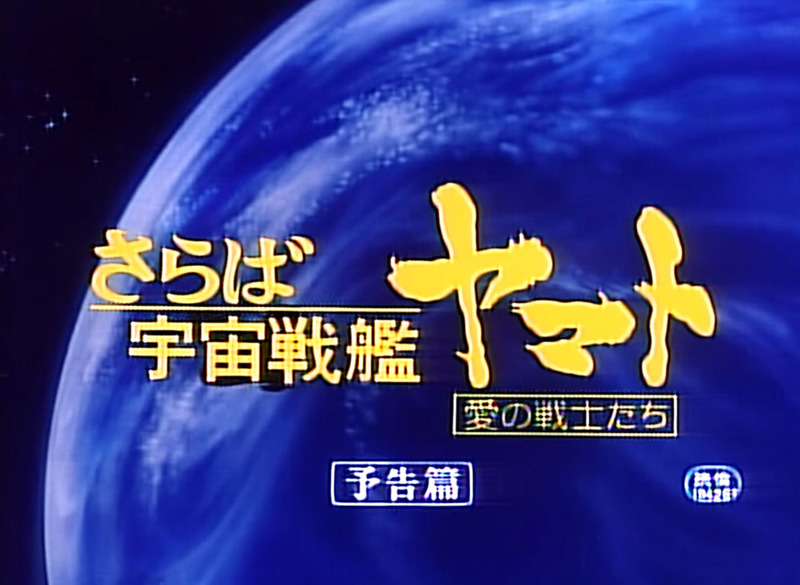 Farewell To Space Battleship Yamato: Soldiers Of Love was a hugely successful epic gotterdammerung of a film in which the revived planet Earth is menaced by the Comet Empire and the crew of the Yamato must defy orders, save Teresa of Telezart, and make the ultimate sacrifice. Produced at breakneck speed by top tier Japanese animation talent like designer and collaborator Leiji Matsumoto, director Noboru Ishiguro, and character designer Yoshikazu Yasuhiko, Farewell is a terrific film that delivers an entire new civilization's worth of space vehicles to threaten our heroes, gives the Comet Empire that monumental, shuddering Hiroshi Miyagawa pipe organ theme, and still delivers Yamato style outer space romantic mysticism in a 151-minute epic that makes every minute count. North America received Voyager Entertainment VHS and DVD releases of this film, but as of now it's out of print. Sure, we all wept at the (spoiler!) climactic sacrifice of the Yamato and her crew at the end of Arrivederci Yamato. However the Yamato would return in October's TV version of the Comet Empire story, Space Battleship Yamato 2. In this series the Yamato's tragic end isn't quite so tragic or final, as we see an expanded version of the film that gives more screentime to our crew, allows space dictator Desslar a chance at redemption, and finally standardizes the Yamato's formerly lackadaisical mechanical design. This show and the first Yamato TV series would be packaged in foreign markets as "Star Blazers" and air in US markets in 1979, a crucial series for many a North American anime fan (like me). Available on DVD as part of Star Blazers and currently out of print. 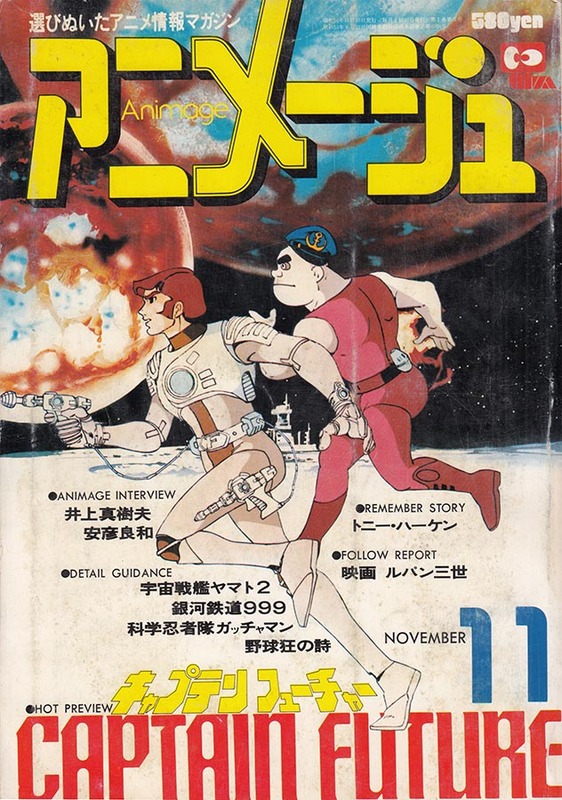 Japanese audiences were experiencing Leiji Matsumoto overload in 1978. Danguard Ace was still on the air, the Yamato was battling the Comet Empire in theaters and on TV, and March would see the first episode of one of Matsumoto's most iconic series, Space Pirate Captain Harlock. Harlock and his forty fellow space pirates defy the evil plant women of the Mazone, who return to Earth after millions of years to lay claim to their ancient-astronaut home. 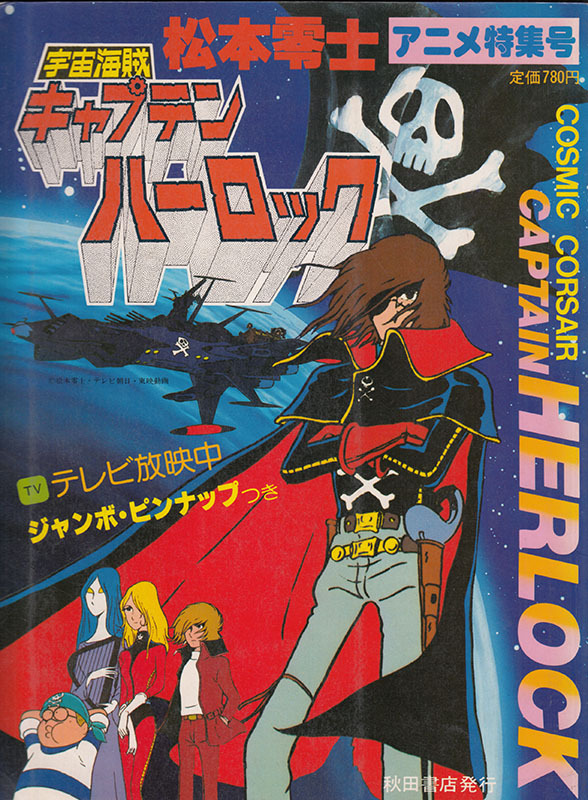 As we mentioned before, this terrific TV series is currently available on streaming video and in a Discotek DVD release, and Harlock would go on to star and co-star in feature films and TV series for decades to come. Not enough Leiji? Enjoy his April '78 science-fiction Journey To The West pastiche SF Saiyuki Starzinger – localized here as Jim Terry's Spaceketeers - or settle in for a ride on the Galaxy Express 999. 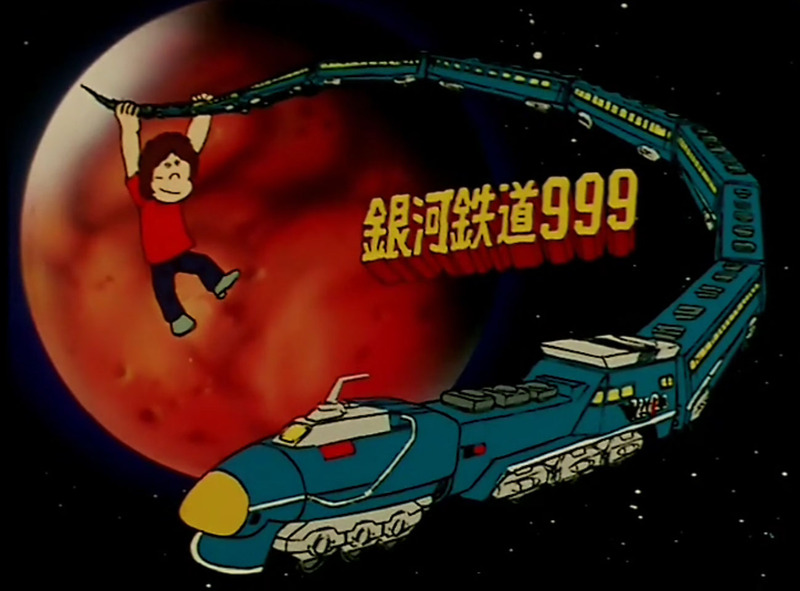 Leiji Matsumoto's wistful meditation on life, death, and everything in between as seen through the eyes of a young boy travelling to Andromeda to get an immortal machine body, Toei's Galaxy Express 999 TV series first aired in September of 1978 and ran for 113 episodes. As we discussed earlier, this series is currently streaming and soon to be available on DVD from Discotek. Harlock wasn't the only space captain zipping around '78; Golden Age SF writer Edmond Hamilton's 1940s hero Captain Future launched in November for 52 episodes of Toei-produced interplanetary adventure. These reasonably faithful pulp adaptations were thankfully updated with 70s era mechanical design and starred the titular Captain Future, Curtis Newton, and his shipmates the android Otho, the robot Grag, Simon "The Brain" Wright, and Space Girlfriend Joan Randall as they battle the evil forces that threaten to wreck the solar system. A big hit in Japan and Europe, the series has seen home video releases in almost every format and almost every region, with the exception of (sigh) North America. Tatsunoko's Science Ninja Team Gatchaman series first aired in '72 – the cast's giant flared jeans are a dead giveaway - for 105 episodes of science ninja vs international criminal action. One of creator Ippei Kuri's most iconic creations, Gatchaman would get a theatrical compilation film in July, just in time to get audiences ready for the October start of the sequel to Gatchaman, Gatchaman II. The missing Condor Joe (spoilers!) returns early on, and the new show wastes no time getting back to battling robot monsters and evil Galactors. 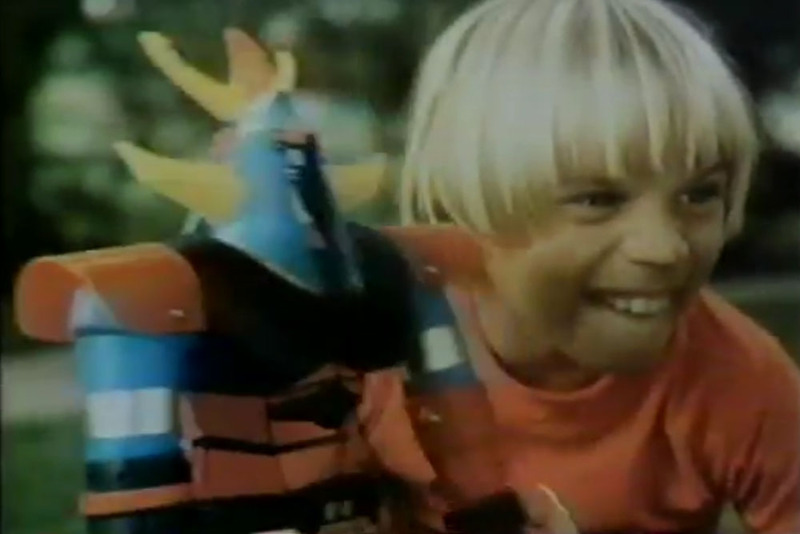 1978 would also be the year that the '72 Gatchaman series would be edited, rewritten, dubbed by an all-star cast of American voice talent including Alan "Wilbur" Young and Casey "American Top 40" Kasem, and reach syndication in America as Battle of The Planets. Packed with action, great characters, and stunning mechanical mayhem, BOTP grabbed Americans by the eyeballs and turned them into what we now call 'anime fans.' Both BOTP and Gatchaman have had several iterations of home video release in North America, and the entire mythic Gatchaman cycle of Gatchaman, Gatchaman II, and Gatchaman F is available on DVD from Sentai, right now for the bargain price of eighty dollars. 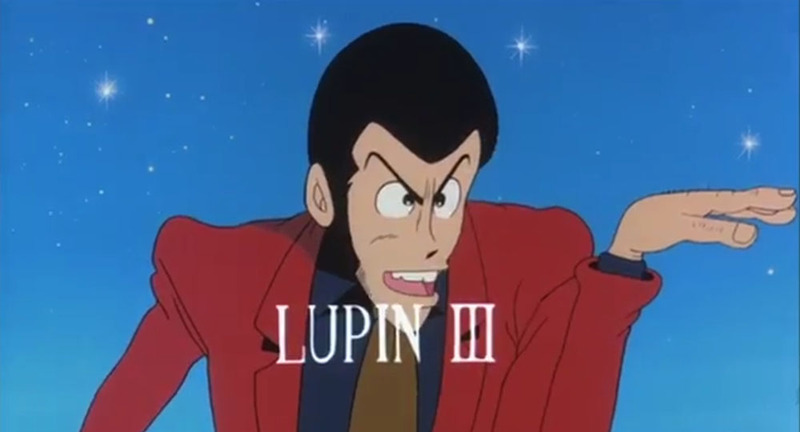 Lupin III, hands down the world's greatest second-story man, safecracker, confidence trickster, and all around thief, made the jump from Monkey Punch's manga and a few hundred TMS produced TV episodes to the big movie screen in his 1978 feature film debut, directed by Mushi Pro vet Soji Yoshikawa and released by Tokyo Movie Shinsha. Known in some circles as "Mystery Of Mamo," this very 70s film is a wild roller coaster ride around the world as Lupin battles the possibly immortal Mamo past sight gags, 2001 references, spaghetti western homages, Clark Bar comic book ads, and the kinds of sleazy, lustful TV Lupin behavior that Hayao Miyazaki would totally abandon when directing the next Lupin III film. Mamo's long-lost English dub is now available on the Discotek DVD along with four (!) other English dubs. The title can be literally translated into English as "Here Comes Miss Modern", "Here Comes Miss High-Collar" ("haikara" a Japanese portmanteau of "high collar"), or "Fashionable Girl Passing By," but in Japan they call this series Haikara-san ga Toru. In 1977, Waki Yamato's original Shoujo Friend manga series won the first Kodansha Manga Award. The Nippon Animation adaptation of Haikara-san ga Toru began airing in March of 1978, taking us all the way back to Tokyo in 1920, where teenager tomboy Benio Hanamura is always getting in trouble and advocating for new-fangled modern ways. Though opposed to arranged marriages, she's engaged to the dreamy young Army captain Shinobu. Benio tries to sabotage the engagement but finds herself falling in love in spite of herself. Can their romance survive war in Manchuria, amnesia, and the Great Kanto Earthquake? A new anime film of Haikara-san was released earlier this year and Eleven Arts licenced it for North America, so look out, here she comes! Hiromi Oka leaps from the pages of the sports shoujo manga classic Aim For The Ace by Suzumu Yamamoto, joins her high school tennis club and finds the tennis superstar inside that only the challenge of Ochofujin and the Demon Coach can bring out. This October '78 remake of the amazing 1972 Aim For The Ace series didn't feature 1972's Osamu Dezaki direction or Akio Sugino's character designs, but that's OK, they were working on the terrific 1979 Aim For The Ace movie. None of Aim For The Ace is commercially available in English in any form. Why is this? Somebody make it happen. April 1978: Tadao Nagahama and an all-star cast of anime geniuses (Masaki Tsuji, Yoshikazu Yasuhiko, Yuki Hijiri, etc.) continues his "Robot Romance" series with Fighting General Daimos. Kazuya Ryuuzaki, a young karate champ/astronaut, returns from deep space along with his sword-slinging Afro-sporting copilot Kyoushirou to find Earth under attack from space aliens fleeing the destroyed planet Baam. 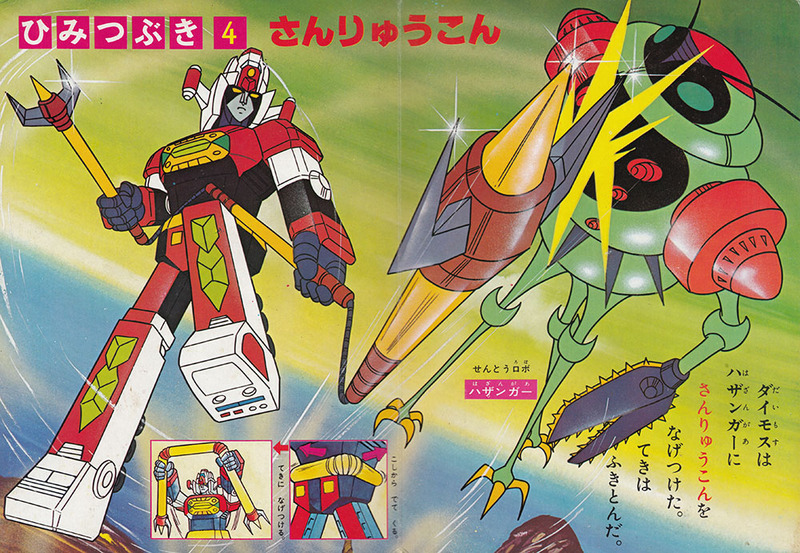 As befits the star of an anime show, only Kazuya can pilot the transforming truck-robot Daimos to battle the invaders. His thirst for vengeance is derailed slightly when he falls in love with the Baam princess Erika. Can their romance survive the struggle between two worlds? Animated by Sunrise under contract to Toei, this show packs a one-two punch of super robot destruction and soapy love story melodrama that totally satisfies. Daimos eventually aired in the Philippines, Italy, Poland, and even in an edited compilation video titled "Star Birds" that was released on home video and a few airings on Pat Robertson's CBN cable network. Robert Louis Stevenson's Treasure Island has enjoyed many cinematic adaptations, and the world of anime is no exception. There have been one, two, at least three separate Japanese cartoon versions of this seminal pirate adventure story. 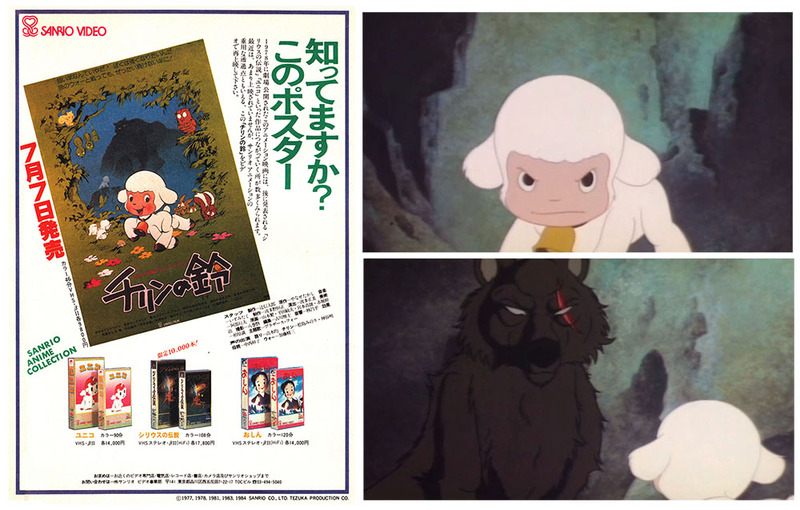 Unquestionably the best Japanese anime iteration – the one without talking animals, anyway - is the October '78 TMS Treasure Island series, directed by genius Osamu Dezaki. This is what he was doing instead of remaking Aim For The Ace, I guess. Treasure Island aired in France, Germany, Italy, Spain, Mexico, Columbia, Taiwan, the Arabic world, and after circumnavigating the globe, finally reached the English language audience via YouTube with TMS subtitles. 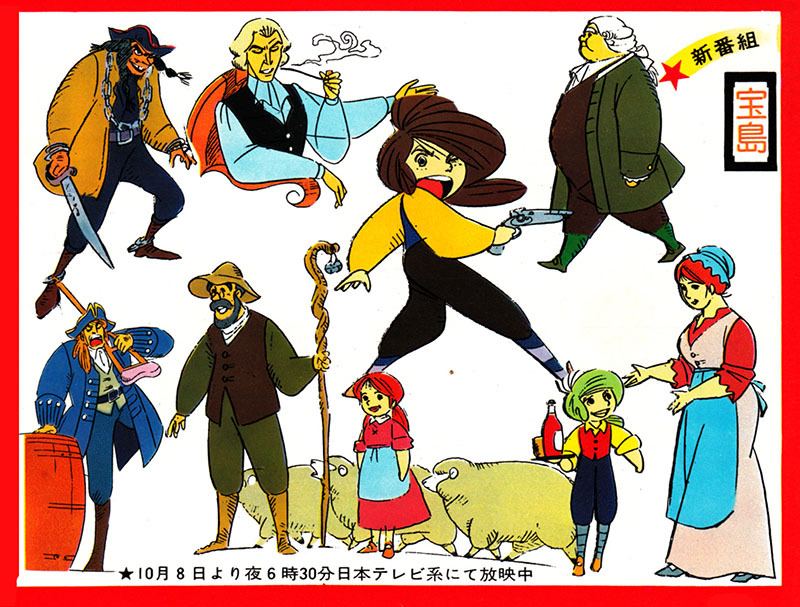 1978 started its journey with the New Years Day premiere of Perrine Story, the 1978 Nippon Animation series based on the Hector Malot novel Sans Familie. Young Perrine struggles to make her way from one end of Europe to another to find her estranged grandfather and experience the clash of class and race at the tail end of the 19th century. Nothing explains the power of Japanese animation quite like its ability to entertain regardless of viewer demographics, and it's when you are on the edge of your seat hoping Perrine and her weakening mother and their long-suffering donkey Polikare can muscle their wagon up the muddy 19th century roads through the Alps, well, that's when you realize the true power of anime. I defy anyone to fail to be moved when that donkey makes a reappearance later in the show, which sadly is unavailable commercially in English. Sanrio, the Hello Kitty people, spent the 1970s branching out into other media, including the shoujo manga magazine Lyrica and a series of animated films, including 1978's Ringing Bell, a 47 minute film based on a children's book about a cute little lamb named Chirin. Devastated when his mother is killed by a wolf, Chirin swears eternal vengeance, and ironically is taught to be a violent survivor by the very same momicide-committing wolf. Chirin grows to learn the world is a terrifying nightmare of unending conflict. You know, for kids! Released on American VHS by Columbia in the 1980s and recently revived on DVD by Discotek, Ringing Bell is a beautifully animated film that illustrates perfectly how even the most talented of artists can completely misjudge their audience. Between April and October of 1978, viewers were treated to what many believe is the best Japanese anime series ever made, Future Boy Conan. Based on Alexander Key's 1970 dystopian YA SF novel "The Incredible Tide" – yes, he's the guy that wrote "Escape To Witch Mountain" - this Nippon Animation series was produced by the anime dream team of Yasuo Otsuka, Isao Takahata, and Hayao Miyazaki. Remember that world war we had back in July 2008, the one that saw the use of super powerful magnetic weapons more powerful than atom bombs? After the world is thrown off its axis, the survivors of a flooded Earth struggle to rebuild civilization, represented by the polar opposites of the techno-fascist Industria and the peaceful, agricultural High Harbor. We first meet our hero, the titular Conan, living a bucolic, shark-fighting life with his grandfather alone on Lonely Island. The world, or what's left of it, intrudes when the girl Lana washes up on shore, with soldiers from Industria in hot pursuit. To protect Lana, Conan leaves Lonely Island and finds both friends and enemies in a world still reeling from the great disaster. 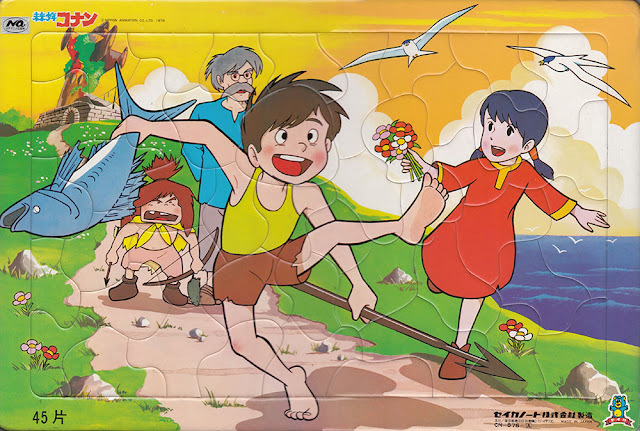 Future Boy Conan is filled with adventure, action, humor, intrigue, disaster, and redemption; it's the kind of broad-appeal anime property that's made its creators famous the world over, and of course is commercially unavailable in English. Naturally, being on the other side of the world, I had no idea these cartoons even existed. But it wasn't so terrible, back in 1978. For instance, one summer night our whole neighborhood kid gang were dropped off at Cobb Center Mall to see a movie. This was back in the day when parents felt perfectly confident in leaving their 8 and 9 and 10 year olds unsupervised at movie theaters. We all got out alive, so I guess it was OK. 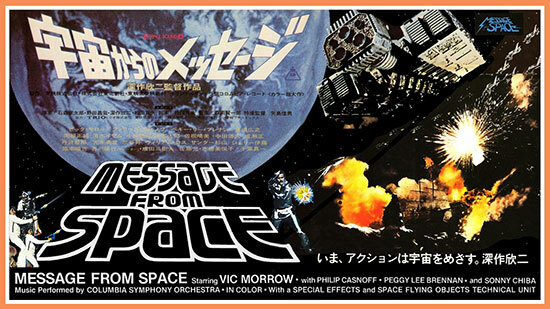 Anyway the movie was a rollicking sci-fi actioner titled Message From Space, and we all agreed it was pretty awesome, almost as good as, if not as good as, that other space movie with the Death Stars and the light sabers. I spent years looking for Message From Space, back when my only hope was to catch a late-night UHF TV broadcast. I'd find out it was directed by the guy who made Battle Royale, and that it starred faded Hollywood royalty and top-of-the-line Japanese movie stars, that Shotaro Ishinomori was one of the writers, that it was a sci-fi updating of the Hakkenden legend, and that there was a followup TV show starring a space ape. You can judge for yourself with the DVD from Shout Factory. So was 1978 anime's greatest year? I think I've presented a pretty solid case, and I didn't even mention Invincible Superman Daitarn 3 or that Pink Lady anime series. But to be honest, who's to say 1977 or 1979 or any other year might not be just as great? In a field that continues to produce amazing work year after year, who knows what classics lie ahead? All I know is, I'll probably be watching.